Whited00r 6 - FAQ & Troubleshooting - READ BEFORE POSTING! If you are reading this, that probably means you are having a bug of one form or another or if you are a new Whited00r user then welcome to our forum! We will help you, if you read below first. If your issue is covered below, then please pay attention to what is said in that section! Looking for the WD7 FAQ? Below is still very relevant, although not for some of the feature bits though as they have been updated. Device support and app support still remain the same! What are the Whited00r 6 Features? Which iPhone or iPod Touch are Supported by Whited00r 6? The Whited00r community supports all ARMv6 CPU family of Apple devices: iPhone 2G, iPhone 3G, iPod Touch 1G and iPod Touch 2G MB model or PB model. How to identify your iPod Touch 2G model: Settings > General > About > Model. If you have an iPod Touch 2G MC Model or PC Model (PC is an MC that was engraved by Apple) sorry but we do not support them yet because those models have an incompatible bootrom. We are working on a iOS firmware for those iPod Touch 2G MC model but it is not ready for release yet & please do not ask when as we will gladly announce it when it is ready. Meanwhile read this thread for alternatives: [Solved] No Whited00r for iPod Touch 2G MC or PC Model? Where Can I download Whited00r 6? Read this very important page first and then look at the navigation bar buttons: Whited00r Tutorial - Installation. Just unzip the iOS Firmware file to your desktop and follow the steps. If you have some problems installing Whited00r read the stickies (it means threads pinned at the top of the forum list) of the Troubleshooting - iPhone & iPod Touch 1G/2G/3G, Unlock & Jailbreak Problems & Issues forum board. And this one can be read after the installation: Whited00r 6 - FAQ & Troubleshooting - READ BEFORE POSTING! as it includes tips about how to enable or disable the Whited00r Features and answer many questions you might have. How can I make a safety backup of all my apps before installing Whited00r? [Solved] Cydia Respring or "Restart SpringBoard" causes Infinite Loop? [Solved] Whited00r 6 - Folder icon in the FastAppSwitching Dock Bug? iTunes App Store - Every Time I try to Download an App it Says "Requires iOS 4.3". I Cannot Find any Apps for Whited00r! Tap on Whited00r's App Market icon and swipe left/right until you find it and you will also see Whited00r 6's exclusive perk: the App Time Machine Store app! The App Market has the App Store icon. So, don't post saying you can't find it, because if you actually read this post, you would have had your answer. Can I get App Time Machine without installing Whited00r 6? 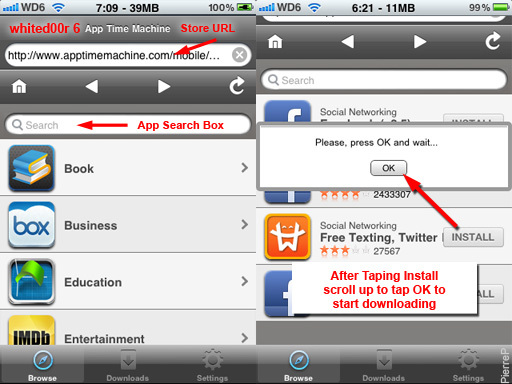 Sorry, it is not possible to install App Time Machine without installing Whited00r 6. If it would be accessible to all the general public, their server would be quickly overwhelmed and would crash promptly. Apps that requires iOS 4+ are not working or crashing! 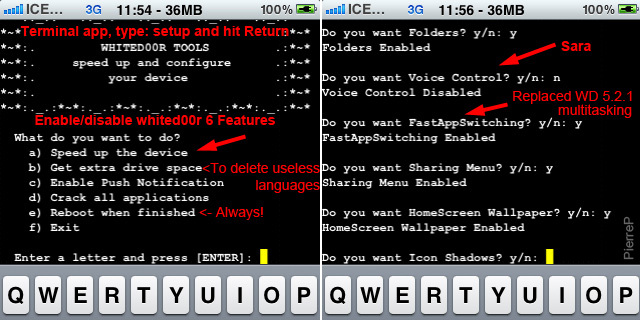 Whited00r provides the look and feel of more recent iOS firmware found in iOS 5 & iOS 6 and includes several speed up tweaks, custom features normally not available for our older devices like internet tethering (using your iPhone as a modem for your laptop or computer or WiFi tablet), Springboard folders, etc & some special apps. It does NOT however provide the capability to run apps that requires iOS higher than the much faster & less taxing iOS 3.1.3. There is no way to make them work, sorry! Or try our Redd00r which runs only on iOS 4.1 or iOS 4.2.1 so it is supporting only the iPhone 3G & iPod Touch 2G as the iPhone & iPod Touch first generation cannot run anything above iOS 3.1.3 but there are some speed & free RAM trade-offs as Whited00r is faster & more fluid. 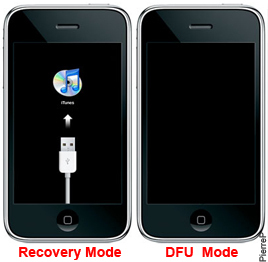 See Redd00r FAQ - iOS 4.1 & iOS 4.2.1 Speed Up & Modding - READ BEFORE POSTING! Why can't I install Apps that Requires iOS 4.3 or upgrade above iOS 4.2.1? ARMv7 = iPhone 3GS, iPhone 4, iPhone 4S, iPod Touch 3G, 4G & 5G, iPad, iPad 2, iPad 3 & iPad Mini. iPhone 3G or 2nd Gen - max iOS 4.2.1 but it's dog-slow, the very limit of what that hardware can take. Whited00r is based on a tweaked iOS 3.1.3 because it is much more fluid with plenty of free available RAM to run apps. Apple could easily require that app developers include iOS backward compatibility to be eligible to iTunes App Store but they decided not to. Apple makes the Xcode software that developers are using to create apps and removed support for ARMv6 binaries compatibility in their Xcode 4.5 version (see Mac Developer Library - Xcode Release Notes for technical details). Apparently they re-enabled ARMv6 binaries compatibility in the current Xcode 4.5.2 according to this. Can I use iCloud on Whited00r iOS 3.1.3 based or stock Apple iOS 4.2.1? Where Can I Find Whited00r Tutorials? Whited00r Tutorial - Carrier Unlock for iPhone 3G & Baseband Check & fix your iPhone 3G baseband before installing Whited00r as it preserves your existing baseband (does not modify it)! [Solved] Whited00r 6 iPhone 3G NO SERVICE NO NETWORK Baseband 05.15.04 - What to do if you have that baseband and want to install Whited00r 6 or if your GPS is not working. If you have iPad Baseband 6.15.00 on your iPhone 3G the GPS will not work and the battery life will be shorter! Whited00r Tutorial - Post Installation - Includes Terminal > setup tool info for enabling or disabling whited00r 6 features. Whited00r Tutorial - Solve Installation Errors - solve the common 1600, 1601 and 16xx errors, and more! A very good wiki: How do I fix errors and problems when trying to restore/upgrade/downgrade my device? How Can I Quickly Get Answers to My Problem? First check the Tutorials linked above or faster than starting a new thread is to simply use the Search Box on the top right of every pages in the Forum because your problem may be already been solved. If the found solution worked also for you, post in that thread to say thanks (the only "salary" Whited00r volunteers & users get) and confirm that it worked for you too as it will help other users with the same problem to spot the best solution. Local Whited00r volunteer experts don't always visit the Troubleshooting forum to re-post solutions they already answered to. Or check the sticky thread for some useful tips: WD 6: Tips to Quickly Solve your Problems/Bugs & Get Answers FAST! I read the tutorials & tips above but cannot solve my problem! Then first read and then post in the appropriate on topic Whited00r Forum not in this Tutorial Forum! How to Enable or Disable Whited00r 6 Features to get more free RAM or better Battery Life? While all the useless Launch Daemons slowing down the device are disabled in Whited00r you can make it even faster or customizing it by using the built-in Whited00r setup tool and disable everything for max speed & battery life: open the Terminal app > type: setup & hit enter. Then select a: Speed up the device. This will open a sub-menu where you can tweak the Daemons & the Whited00r features. I can't close apps out of multitasking! This is because we use a new tweak in Whited00r 6 called FastAppSwitching in Terminal > setup Tool, which instead of showing actual open apps, just shows the recently opened apps. Whited00r 6 doesn't even use backgrounder, so none of the apps are actually in the background. It is more of a fast app switcher. Whited00r 6 does not have backgrounder installed anymore because we wanted more speed & more free RAM to run apps. 2- Search for Backgrounder in Cydia & install it. If Cydia ask you to Respring, don't do it! Just tap the Home button to close Cydia and in Whited00r 6 you can find a Respring switch in > Settings > General > and scroll to the bottom of the tab. 3- Optional: add our repo for Whited00r and Redd00r users in Cydia/Sources and install iOS 3 Multitasking from our Repod00r Repo. 4- Turn off the iPhone, wait a couple of seconds and turn back on. Where are the music controls/respring Easter egg in multitasking? 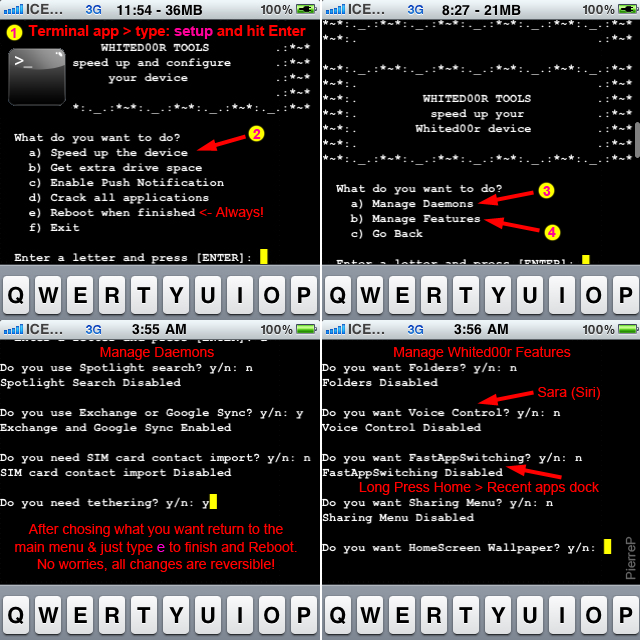 You probably are wanting to respring using multitasking as you did in previous Whited00r versions. As with above, we replaced this tweak found in the older WD 5.2.1 with a different one that lacks these features. It is possible any issues you are having (no response, etc) are caused by the server being overloaded. If Sara doesn't respond/takes a long time, this is most likely the issue. Sara is crashing with location related responses for most people, this is a know bug, and we do not need multiple topics about it. Unless you have specific information which you think could help solve this (such as it works in some cases but not others) please refrain from posting generically that it doesn't work. Push Notifications is Not Working in Whited00r 6 Unlocked! 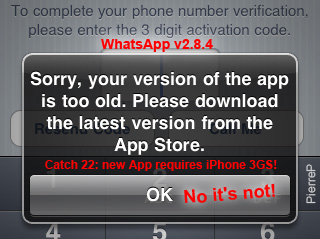 WhatsApp "Your Version of The App is Too Old..." Error! See our most active an up-to-date WhatsApp thread: [50% Solved] WhatsApp WD6 Problem - Partially Working Update! Whited00r on Facebook - Add some Likes! Re: Whited00r 6 - FAQ & Troubleshooting - READ BEFORE POSTING! Hmm... It doesn't have a rotation lock button. Darn it. That's right, there is no Rotation Lock switch in the Terminal > type: setup > Speed Up > Daemons. I can decide on the fly if I want to enable/disable rotation. When lying down for example, I don't want Safari to rotate but some sites need to be rotated to be usable so a quick swipe on the Statusbar and I can modify rotation without closing Safari. just installed this on my iphone 2g the unlocked version but it still says no sim card? i cant install ultrasn0w keep getting error any help plz? everything else works great! love the time machine app! Sometimes after a respring I see "Searching" instead of the cellular provider's name and once "No SIM". Turning off the phone, waiting a few seconds before turning back on solved the No SIM and Searching issue. You could also remove the SIM, make sure the contacts are clean and retry. On my iPhone 3G running whited00r 6 if I download an app that requires Respring the phone hangs and gets stuck on the wait animation. To get of there hard reset: hold simultaneously the Home and Power buttons until the Apple logo appears. Workaround: when Cydia ask for Respring don't do it. Hit the Home button to kill Cydia and go to: Settings > General > and scroll down to Respring. Or hold down the Power button and turn off the device, wait a couple of seconds and turn back on. I tried to respring via SBSettings but it gives a warning instead of showing the Respring option: Cydia is doing something and that it may be dangerous! I also don't know what happened, but week after installation I can't connect to WiFi, don't receive calls - phone doesn't ring, only when I unlock I see missed calls, sms arrives couple hours late. Did you try doing a hard reset (hold both Home and Power buttons until the Apple logo appears)? Are you sure the phone is NOT in > Settings > Airplane Mode? If it does not fix the problems, I would download a fresh copy of whited00r 6 and do a clean install without the SIM and reboot twice before inserting the SIM and making any mods to the phone.